Mitm6 is a pentesting tool that exploits the default configuration of Windows to take over the default DNS server. It does this by replying to DHCPv6 messages, providing victims with a link-local IPv6 address and setting the attackers host as default DNS server. As DNS server, mitm6 will selectively reply to DNS queries of the attackers choosing and redirect the victims traffic to the attacker machine instead of the legitimate server. For a full explanation of the attack, see this blog about mitm6. Mitm6 is designed to work together with ntlmrelayx from impacket for WPAD spoofing and credential relaying. For python 2.7, it uses the ipaddress backport module. You can install the latest release from PyPI with pip install mitm6, or the latest version from source with python setup.py install after cloning this git repository. Qualified Domain Name (FQDN) option. You can manually override most of the autodetect options (though overriding the MAC address will break things). If the network has some hardware which blocks or detects rogue Router Advertisement messages, you can add the --no-ra flag to not broadcast those. 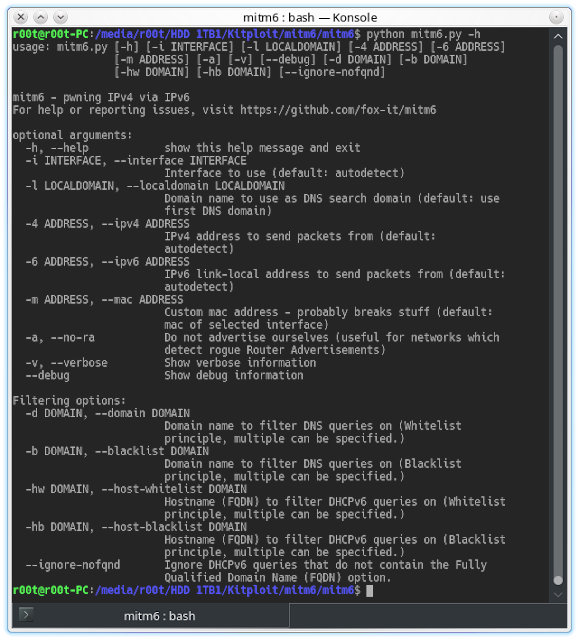 Router Advertisements are not needed for mitm6 to work since it relies mainly on DHCPv6 messages. Several filtering options are available to select which hosts you want to attack and spoof. First there are the --host-whitelist and --host-blacklist options (or -hw and -hb for short), which take a (partial) domain as argument. Incoming DHCPv6 requests will be filtered against this list. The property checked is the DHCPv6 FQND option, in which the client provides its hostname. The same applies for DNS requests, for this the --domain option (or -d) is available, where you can supply which domain(s) you want to spoof. Blacklisting is also possible with --blacklist/-b. For both the host and DNS filtering, simple string matching is performed. So if you choose to reply to wpad, it will also reply to queries for wpad.corpdomain.com. If you want more specific filtering, use both the whitelist and blacklist options, since the blacklist takes precedence over the whitelist. By default the first domain specified will be used as the DNS search domain, if you explicitliy want to specify this domain yourself use the --localdomain option. mitm6 is designed as a penetration testing tool and should thus impact the network as little as possible. This is the main reason mitm6 doesn't implement a full man-in-the-middle attack currently, like we see in for example the SLAAC attack. To further minimize the impact, the IP addresses assigned have low time-to-live (TTL) values. The lease will expire within 5 minutes when mitm6 is stopped, which will remove the DNS server from the victims configuration. To prevent DNS replies getting cached, all replies are sent with a TTL of 100 seconds, which makes sure the cache is cleared within minutes after the tool exits. mitm6 is designed to be used with ntlmrelayx. You should run the tools next to each other, in this scenario mitm6 will spoof the DNS, causing victims to connect to ntlmrelayx for HTTP and SMB connections. For this you have to make sure to run ntlmrelayx with the -6 option, which will make it listen on both IPv4 and IPv6. To obtain credentials for WPAD, specify the WPAD hostname to spoof with -wh HOSTNAME (any non-existing hostname in the local domain will work since mitm6 is the DNS server). Optionally you can also use the -wa N parameter with a number of attempts to prompt for authentication for the WPAD file itself in case you suspect victims do not have the MS16-077 patch applied.